Link drawings to transformation chains, so that the drawings can be animated using the chains. In the Timeline or Node view, select the drawing layer containing the drawing you want to link to an existing deformation chain. The deformation chain has to exist on that same layer. You cannot associate a drawing to a chain created on a different layer. In the Deformation toolbar, select the desired chain from the Transformation Chain drop-down list. 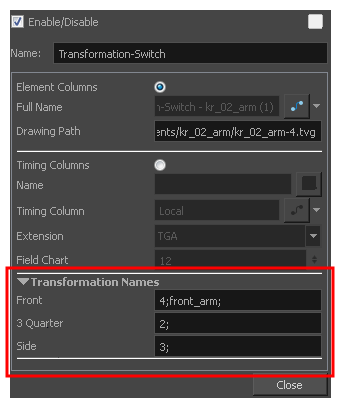 In the Node view, select the Transformation-Switch contained in the deformation group and in the Layer Properties view, type the drawing name in the field corresponding to the desired chain. The drawing names must be semi-colon separated.